As a supplier, you may find yourself in a sort of joint venture with your distributors, retailers, installers, or other business partners. Video communication can be one of the most powerful tools to develop, coordinate and motivate them. 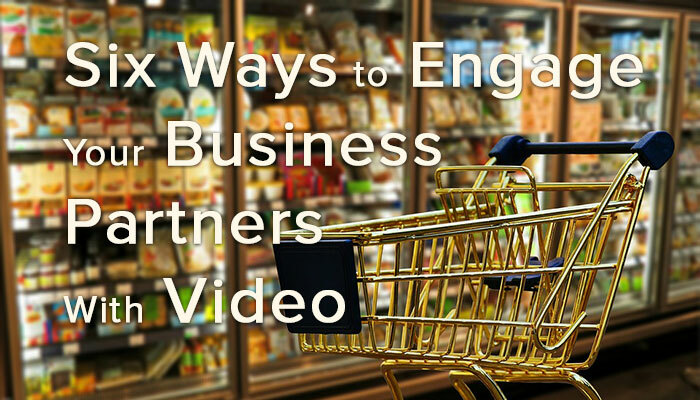 Here are six ways we have used video to engage our client’s business partners with video. The problem: Your target audience is often other sales people and you can’t force them to sell your product when you’re not their boss. They may have other things that they like to show the end consumer. So what do you do? Video is a powerful way to reach them. Here are six ideas we have used video to engage our client’s partners and a little about what we have learned while doing it. The more your partners know about you, your company, and the products you supply, the more they will care about the product and the more they will communicate that care to the end customer. If information is power, than video is a great way to empower your partners so they can turn a sale in a graceful informed way. At the same time, you can turn it around and listen to your partner’s needs. Communication is a two way street. For instance, we supported a major retail chain in a live two way feed of their headquarter meeting. It was great way to reach geographically remote retailers and to let them participate in the Q & A in real time. Not only were they communicating with their partners, their partners were able to communicate back. When retailers saw it, not only did they feel included in the design process, they were able to speak with the consumer in a highly intelligent and engaging way. When you include your partners in the origins of your ideas, they can get excited about the results. One way to do that is to let them see behind the scenes of manufacturing and the design process with video. For instance, we produced a video showing the lead designer for a major clothing brand talking about his latest line. He talked about why he made the choices he made in a very cool way. He spoke about what inspired him and how he intended the clothing to be worn. Our client reported, “When retailers saw it, not only did they feel included in the design process, they were able to speak with the consumer in a highly intelligent and engaging way.” They could talk about the smallest details of individual items or about the entire collection and why it was relevant, current, and hip. You can ask re-sellers to “push” the product, but they’re not always very good at it. And you’re not their sales manager so you can’t make them focus on your product over the other products they might be selling. So what do you do? You make ’em laugh. You make ’em cry. You change their lives with video. When emotions are involved, they remember you. We created a series of funny videos that helped drug store staff learn how to deal with the unusually uncomfortable sales challenges that their product line evoked and and how to deal with the stereotypical customers. It helped the pharmacists learn without feeling they were learning. If your partners need technical support, it’s you’re job to supply it. Video can arm them with the answers that can help during a sale. You can periodically update them on industry trends and company initiatives. You can give them the confidence they need as sales people. Video is a great way to do all this. At WPRNY, we manage the video assets and training material so that we can keep it up-to-date and change it with the next upgrade. Of course, video is a great way to communicate sales incentives and to build excitement. It lets partners really get a good idea about that Hawaiian vacation or how much fun they’ll have at the golf tournament. Video also is a great way to recognize achievers and to showcase how they did it. Providing your partners with video to use at point of sale might be exactly what helps them make the case for your product to the consumer. This can be showing above your display or on an interactive iPad kiosk. It’s a joint venture and you have an obligation to support them. You’re something from them — a sales force and their retail space. Part of that bargain is for you to provide them with the material they need to move the product. Sometimes, video at POS is exactly what they’re looking for. Whether it’s through training, marketing or sales support; Your business partners are looking to you to minimize and reduce THEIR cost of sales. Video can be one of the most powerful ways to accomplish this. These are just six general ideas on how to do it. Of course, the ultimate success of any initiative is in the details. If you’re looking for a video production company to help you implement ideas like these from beginning to end, would love to speak with you about it. Give us a call or start here to tell us what you’re thinking and you will receive a proposal that you can show your colleagues within one or two business days.